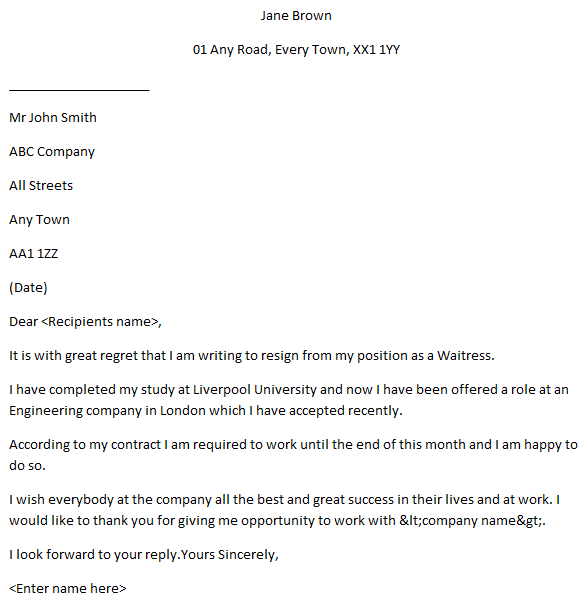 Use this resignation letter example for a waitress to leave her job on good terms. Amend it as suitable before sending it to your employer. It is with great regret that I am writing to resign from my position as a Waitress. I have completed my study at Liverpool University and now I have been offered a role at an Engineering company in London which I have accepted recently. According to my contract I am required to work until the end of this month and I am happy to do so. I wish everybody at the company all the best and great success in their lives and at work. I would like to thank you for giving me opportunity to work with <company name>.